Phyllis keeps our shop in shape. She is queen of schedules and organization, and moves projects through the agency from development to completion. Her eye for detail makes all of our jobs easier.Always ahead of the game, Phyllis has never missed a deadline in her more than 25 years in the business. 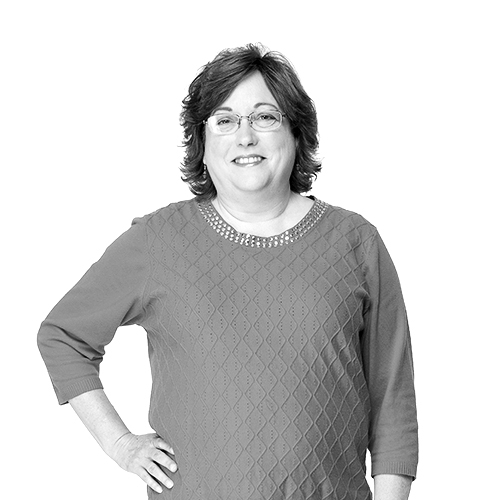 She’s our go-to for workflow and keeping track of budgets.When she’s not building cost estimates and keeping us on track, Phyllis can be found spending time at home with her two wonderful daughters, two awesome grandsons and one loveable puppy, Gidget. If she’s not at home, look for her on a beach, any beach. She loves to visit the coast. San Antonio Convention and Visitors Bureau, South Padre Island Convention and Visitors Bureau, Plano Convention and Visitors Bureau, Baptist Hospital System, Children's Hospital of San Antonio, Biomed SA, Spurs Sports and Entertainment, Valero Alamo Bowl, CPS Energy, Hyatt Hill Country Resort & Spa, Sprint, and NatureSweet.